James Hildreth added 86 to his first innings 187 as Somerset made Middlesex toil at Taunton. 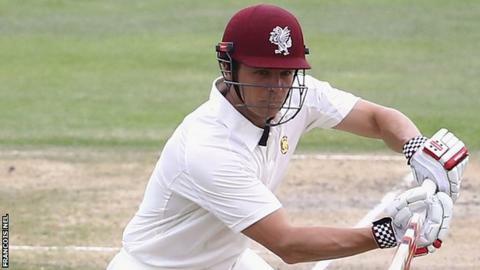 Marcus Trescothick and James Hildreth pounded Middlesex again as Somerset dominated on day three at Taunton. The pair, who shared 327 runs in the first innings, scored 76 and 86 respectively as Somerset made 310 to set the visitors a target of 402. Steve Finn, James Harris and Ollie Rayner each took three wickets. Middlesex reached 31-0 at stumps, their first innings having closed at 317 in the morning after Lewis Gregory took two wickets to finish with 6-101. Trescothick was soon motoring again and made 76 from 115 balls with 12 fours and two sixes. The former England opener shared stands of 82 with Tom Cooper (42) and 51 with Hildreth against an attack deprived of Tim Murtagh, who suffered a side injury which prevented him bowling on the third day or batting in Middlesex's first innings. Hildreth advanced to 86 from 153 balls with nine fours and a six before lifting Finn into the hands of Adam Voges at deep mid-wicket. Middlesex were happy to see him go as between them, Hildreth and Trescothick hit 70 fours and six sixes during the match. Middlesex openers Nick Gubbins and Sam Robson came unscathed through seven overs before the close and Somerset encountered a late injury worry of their own when Jamie Overton limped off after bowling only seven balls. They will hope he makes a swift recovery overnight as they look for their first win of the summer. "It is a heel problem and we will need to assess it in the morning. "Hopefully I will be OK. We feel we have got enough runs if we bowl well tomorrow and it promises to be an interesting day." "We still feel well in the game. This is a fast-scoring ground and James Hildreth has proved for Somerset that if a batsman gets in it is possible for him to make big runs. "A lot could depend on the weather tomorrow. I managed to turn some balls to a left-hander in Marcus Trescothick and it will be interesting to see what Abdur Rehman gets from the pitch. "But even if we get tied down for a period there will be time to get the required runs."